But how could that be? Wasn’t He Christ already? Why haven’t commentators questioned this seeming contradiction? After all, in Matthew 16:15-17, we read: “He said to them, ‘But who do you say that I am?’ (16) Simon Peter answered, ‘You are the Christ, the Son of the living God.’ (17) And Jesus said to him, ‘Blessed are you, Simon Barjona, because flesh and blood did not reveal this to you, but My Father who is in heaven.’ ” This was a yet-uncrucified Jesus who is rightly called Christ. Thus, we need a better understanding of why the Book of Acts would state that God “made” Jesus the Christ after the crucifixion. Heb. 2:9 is one of a handful of verses that underscore the matter under discussion here. The verse includes this statement: “…Jesus, because of the suffering of death crowned with glory and honor…,” and from this detail (“suffering of death”) we understand that this crowning refers to the same crowning we read of in Acts 2:36. The action taken there in “making” Jesus our Lord (i.e., ruler, or king) is simply the business of His heavenly coronation. Likewise, in I Peter 1:21 we see that the suffering and Resurrection precede the crowning: “God, who raised him from the dead and gave Him glory…” The act of giving Jesus glory is shown to follow the act of raising Him from the dead. And in Acts 3:11, we find Peter making the same point about the timing of Jesus’s coronation: “The God of Abraham, Isaac, and Jacob, the God of our fathers, has glorified His servant Jesus, the one whom you delivered and disowned in the presence of Pilate…” The Jesus whom the Jews delivered to Pilate is the one whom God glorified. Always, the cross is shown to have preceded Jesus’ heavenly glorification and kingship. 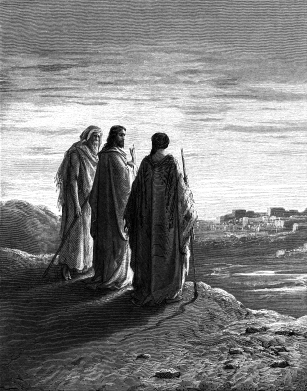 Road to Emmaus is an engraving by Gustav Dore. Thus, it was at this occasion—after the death, burial, and resurrection—that Jesus was anointed as our king—not at His baptism, and not anytime during His public ministry. “Anoint: The practice of anointing [signified] consecration to a holy or sacred use; hence the anointing of the high priest (Ex. 29:29; Lev. 4:3)… The high priest and the king are thus called “the anointed” (Lev. 4:3, 5, 16; 6:20; Ps. 132:10). Anointing a king was equivalent to crowning him (1 Sam. 16:13; 2 Sam. 2:4, etc.). Prophets were also anointed (I Kings 19:16; I Chr. 16:22; Ps. 105:15). Having considered these definitions we can return to our question: How could it be said of Christ in Acts 2:36 that “God has made Him both Lord and Christ”—literally, Ruler and Anointed—if Jesus had already been designated as the Anointed prior to the cross? Our answer begins by opening ourselves up to the possibility of multiple anointings. Since we know that Jesus had already been anointed (had already been called “the Christ”) before going to the cross, we surmise that He had at least two anointings. The two different occasions could be moments when He was anointed to different offices of His three-fold office of prophet, priest, and king. That being the case, we have no conflict in what we read in scripture, and the words of Acts 2:36 come as no surprise. As we explore this insight, other matters begin to become clearer to us. It appears that most commentators, when they refer to Jesus’ anointing, confine it to one incident, occurring at one moment—at his baptism by John the Baptist—and they treat it as pertaining to all three of His offices simultaneously: prophet, priest, and king. To further confirm the prevalence of that assumption, I searched the Internet, cross-referencing such phrases as “Jesus was anointed as” or “anointing of Jesus” with the individual words “prophet,” “priest,” and “king,” and I found that all of the search results I explored (approximately 10 of them) took for granted the idea that the anointing of Jesus was a threefold, simultaneous anointing, executed at His baptism. Further, the Catechism of the Catholic Church—to use it for an example—states that “It was necessary that the Messiah be anointed by the Spirit of the Lord at once as king and priest, and also as prophet.” Thus, the idea that Jesus’ anointing occurred all “at once” is well-entrenched. But these assumptions are not what we get from a closer examination of scripture. We have already demonstrated, for instance, that there was a kingly anointing apart from this presumed threefold anointing. We should consider, too, the nature of the offices themselves and how they interrelate. Minister and author Don Simpson, of Fort Worth, Texas, understands this topic well and shared the following information in at least one of his sermons. As a visual aid, Simpson uses a circle with the word “God” written at the top and the word “Man” at the bottom. His aim is to show how God communicated to Man and how Man responded back to God. The word “Prophet” is indicated at a point on the circle that would correspond to about 2 o’clock. Continuing along the circle in a clockwise direction, the word “King” is indicated at 4 o’clock. We already understand that “Man” appears at the bottom, at 6 o’clock. At a point that corresponds to 9 o’clock, Simpson places the word “Priest.” Thus, rotating clockwise from the top, we see this order of things: God – Prophet – King – Man – Priest. The idea is that God speaks to the prophet; the prophet in turn relays God’s will to the king, as Nathan did to David, or as Elijah attempted to do with Ahab; the king (if he is an obedient king, that is) conveys God’s will to Man. Thus God’s will is made known to His people. The rest of the circle takes us from Man to Priest to God, that being from the bottom of the circle on around to the top. The people have opportunity to relate back to God, and they do that by acknowledgement of and sacrifice for their sins, which they do by going to the Priest. The Priest completes the cycle by offering their sacrifices to God. Simpson says that in Biblical history there have been individuals who qualified as more than one of these five entities. Eli, for instance, was prophet, priest, and man. But only Jesus, Simpson says, was all five, and the perfection of all five. He was perfect God. He was perfect man. And He executed all three offices—prophet, priest, and king—to perfection. Given Simpson’s insights, we can return to our subject with a clearer perspective. We were considering the timing and order of Jesus’ anointings. In the Old Testament, kings were anointed, priests were anointed, and prophets were anointed. Unless the context specifically indicates the role, we cannot always be certain of which office an anointing signifies. But we shall see that it was not possible that Jesus became king or priest at His baptism. There is no question about the role Christ assumed at His anointing as mentioned in Acts 2:36. He was made “both Lord and Anointed.” He was made Lord. Lord means ruler. In other words, He was crowned king. If someone wants to argue that Jesus was anointed as the King of the Jews on some prior occasion, that is his or her prerogative, but that kingship, real or not, would have no bearing on Jesus’s kingship over the church, and that is the only kingship (it could also be regarded as His headship) which we are concerned with in this study. And we must acknowledge that His headship over the church is scriptural and relevant in every way. It was necessary for Jesus to “arise” to this condition, just as it was necessary for Him to be “made perfect… through sufferings” for this anointing to occur. We have doubly established that Jesus’ appointment to the high priesthood began after the cross. So what office was signified by this anointing? It is probably obvious where this argument is headed, because it has already been demonstrated when Jesus’ anointings as king and priest occurred. By process of elimination one can deduce that this baptismal anointing could only be an anointing of prophet. But let us look to the scriptures for a positive identification. One key to this scripture is the fact that the verse indicates not only that He was here anointed, but that He was here empowered by the Holy Spirit. It is only by empowerment that he is able to give “recovery of sight for the blind.” And let us remember that Acts 10:38, which refers to this same incident, says that “God anointed him with the Holy Spirit and with power” at his baptism. But empowerment for what? Empowerment to be king of an earthly race? What Heaven-sent supernatural powers would He exercise in carrying out His kingly duties to the nation? What miracles did Israel’s kings ever exercise, purely in fulfilling their roles as kings? Theirs was an administrative chore, not a supernatural calling. What about the priesthood? What Heaven-sent supernatural powers did a priest exercise in Israel? If one is inclined here to interject that Aaron performed miraculous deeds before Pharaoh, let us remember that at that point Aaron was not yet priest. In this earlier part of his life, Aaron was instead acting as God’s emissary. Aaron did not become high priest until after the exodus had begun from Egypt. No, our answer is that priests were not empowered to do supernatural works by the bidding of the Holy Spirit. So, finally, we are left to consider the prophetic office. What Heaven-sent supernatural powers would a prophet exercise? Yes, here we can plainly see which office it was that served as vessel for the Holy Spirit. Think of Moses, Elijah, Daniel—instruments all of Jehovah’s hand. The scriptures do not portray kings as direct receivers or relayers of the Holy Spirit’s directives. The scriptures do not show priests exercising these powers. It was the prophets who spoke the Lord’s will. It was the prophets who parted the waters or called down fire from heaven. The prophets were the lawgivers of divine law. They were those who preached. They were those who performed God’s miracles by the power of the Holy Spirit. And it is understandable why those two functions—the giving of God’s words, and the performing of miraculous signs and wonders—should be combined in the office of the self-same individual. For it is only by miraculous signs and wonders that the world could have adequate confirmation of the fact that the message, and the messenger, were from God. Some may think of King David as one who was a vessel of divine powers, but we must be careful here not to smuggle in the idea of prophetic powers being exercised by a king. David was also a prophet, as is established in Acts 2:29-30 (“David… both died and was buried, and his tomb is with us to this day. (30) And so, because he was a prophet…”) When David acted as prophet He was not acting as king. It is as prophet that men are used by the Holy Spirit. If Godly power flows through a man, that man is acting as prophet, whether in striking a rock to bring forth water, in decreeing God’s law, or in predicting the future. A king, by contrast, did not need Godly power to carry out administrative chores in a governmental office. Nor did a priest need Godly power to offer sacrifices to the Lord. Given the fact that Jesus’s baptismal anointing was accompanied by empowerment, we should understand this anointing as His prophetic anointing. Consider what Jesus says of His works during His pre-cross ministry, works that are described in Luke 7:21-22: “At that very time He cured many people of diseases and afflictions and evil spirits; and He gave sight to many who were blind. (22) And He answered and said to them, ‘Go and report to John what you have seen and heard: the blind receive sight, the lame walk, the lepers are cleansed, and the deaf hear, the dead are raised up, the poor have the gospel preached to them.’ ” These are works of empowerment and proclamation. These are the works of a prophet. Meanwhile, we have established that of the three offices held by Jesus, two of these began for Him after the crucifixion. It was for the office of prophet, and for no other office, that Jesus was anointed at His baptism. It was only as prophet that Christ completed His work of saving man. We can understand that in doing this work Christ was aided by supernatural helps, but that these supernatural helps were of the same kind as was provided to other, previous prophets.